Learn how to introduce yourself and your friends in Finnish. Matti ja Antti ovat kahvilla. Kaisa tulee paikalle. Antti: Saanko esitellä, tyttöystäväni Kaisa. Matti: Hauska tutustua, minun nimeni on Matti. Kaisa: Hauska tutustua. Oletko kotoisin Helsingistä? Matti: En, olen kotoisin Turusta. Olen turkulainen. Mistä sinä olet kotoisin? Kaisa: Minä olen kotoisin Tampereelta. Olen asunut Helsingissä kaksi vuotta. Antti: Minä en ole kotoisin kaupungista, vaan maalta. Minä tulen Vihdistä. Finnish language has a thing called possessive suffix. It indicates possession, but it's different from the genitive case. It can be translated as ~ "my, your, his, ours, their"
Ending -sta or -lta means "from". Olen kotoisin Turusta - I come from Turku. See the grammar part for details. More names of the towns. Minä olen suomalainen. Hän on ruotsalainen. I'm a Finn. He's a Swede. Ethnicities and names of the inhabitants are formed with -lainen suffix, wich is added after the name of the country. Names of the nationalities are spelled with the small initial letter. Names of the languages are the same as the names of the country. Notice that the name of the language is spelled with small initial letter. Puhun suomea /suomen kieltä hyvin. Haluaisin osata venäjää / venäjän kieltä. I'd like to speak Russian. More countries, nationalities and languages. 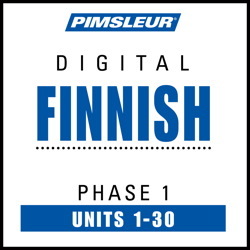 Want to learn Finnish? See the User's guide and learn how to use this site.